Jala is a Nord merchant in Solitude. She will often be found at her stand while trying to sell her produce. Some of her taglines include "You look like you could do with a ripe apple. Or a tomato, cabbage or leek? ", "An apple to keep you healthy? A tomato to keep you strong? Surely you need one or the other...", "Fruit, fresh off the boat! The freshest in Skyrim! ", "Get your fresh fruit and produce here!" and "Apples, tomatoes, leeks and cabbages! Fresh and ripe!" She hates the Stormcloaks due to the fact that they killed her brother in Whiterun. As a result she will often say to you, "You get around, right? If you come across any Stormcloaks... gut one for me. They did the same to my brother in Whiterun." She also seems to be concerned about her shipments being attacked and will tell you, "I have my ways, but it's not easy these days. The Blackblood Marauders have been plundering ships off the coast. A lot of people been hurt by their foolishness." Later, however, she will be overjoyed at the fact that they have been killed and she will freely admit that "It's been easier lately. The Blackblood Marauders haven't been seen since the Icerunner attack, so my shipments have been more regular." If you ask her about her customers she will either remark, "At times. Jaree-Ra stopped by the other day. Told me to keep an eye out for him, see if any new people arrived in the city. ", "Everyone who's anyone. Viarmo bought an apple the other day, said he was looking for a new student. ", "That I do. I had a messenger from Dragon Bridge stop here on his way to the Blue Palace, not too long ago." or "Not lately, business has been slow." 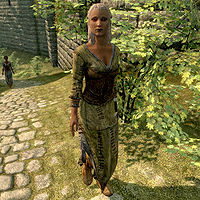 Jala is also present at Roggvir's execution where she can be heard saying, "Some gate guard you were!" and "You betrayed us!" She wears a set of green farm clothes and a pair of boots, and carries a small amount of gold along with the key to her house. She relies on a basic iron dagger for defense. According to the Creation Kit, she is the girlfriend of Ahtar. Considerable dialogue was written for Addvar and his various customers. Unfortunately, they were recorded in Jala's voice, and are mixed with Jala's other dialogue. See Addvar Bugs for this dialogue. Due to incorrect conditions, she will say the Blackblood Marauders are a problem even if you've wiped them out. Inversely she may also say they have not been seen since the Icerunner attack before you even begin the quest. This page was last modified on 19 June 2015, at 17:52.